Being able to predict possible health problems is one of the major benefits of sequencing the human genome. Vice President of Applied Genomics at Illumina Dawn Barry spoke to the Pacific Ridge community today about the scientific advancements in genomics made since the connection between DNA and genes was first explored in 1953.The technology has come far in the years since the first human genome was sequenced in 1999, but, she cautions, it still has a way to go. Ms. Barry explained the potential genomics has for transforming the current medical system from one that addresses disease once it is present to one that can successfully focus on prevention and health promotion tailored to individuals. 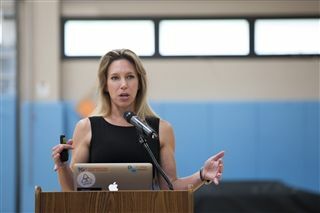 She urged students to educate themselves further about genomics and noted that numerous careers are available in the field for scientists and non-scientists alike.